Ralph, played nicely by John C. Reilly moves into a new adventure with his pal Venellope played warmly and pleasantly by Sarah Silverman. The new adventure revolves around the demise of Vanellope’s game machine. She and Ralph learn that the driving wheel of her machine is broken and there is only one remaining part which can replace what is broken. To get to it they must enter the internet which is a new adventure for the two where anything can happen. They quickly meet KnowsMore (Alan Tudyk), he is the information page in the electrical sparkling world they have entered. By entering a word on his panel he spouts many options available with that word. Sounds like the internet. The substance of the film is the friendship the two characters have for each other and how delicate sustaining that relationship can be. The activity takes place in an animated field which is the internet. They are constantly approached with a deal maker who offers options and opportunities at every turn. Sounds familiar. The animators fill the screen with places, buildings and signs which are familiar locations on the real internet. It is all fun except for the monster which appears to have origins in King Kong that menaces the two late in the film. Every once in a while a Disney character appears, most of the Disney heroins play a part as Vanellope sees her self as heroic because of her award winning driving. Ralph finds himself dressed like Snow White at one point after one of his manny falls. The sweet pleasant little girl driver and the simple but decent good man work together to battle the virus (a dark black wisp like creature with a red eye) and as expected they are successful. 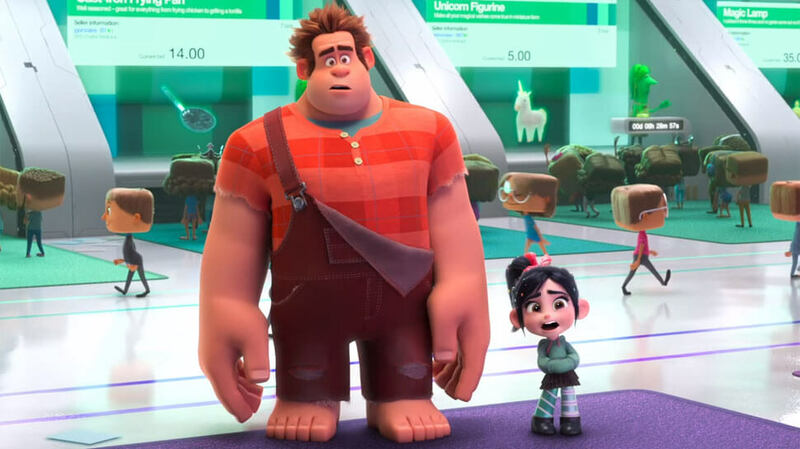 The imagination of the interior of the internet is far superior to the old “Tron” film which were not successful, because they lacked the personalities, adventure and comedy that Ralph and Venellope bring to the Ralph films. The second film in a series is not usually as interesting as the first, and that is the case here, however the architecture as created by the imagineers at Disney are spectacular enough to make for an interesting part 2. MPAA Rating: Rated PG for some action and rude humor.